As commemoration of the 70th anniversary of D-Day is taking place, I wanted to share one of my favourite stories from Firefight. It’s about my very privileged encounter in 1989 with one of the heroes from that important Second World War battle. It was one of those life experiences that I’ll never forget. In the summer of 1989, as a new Canadian Airborne Regiment soldier, I was assigned to be full-time driver for a visiting VIP. As I drove to the airport to pick him up, I assumed that he was just some dignitary with an honorary title to be escorted around town. 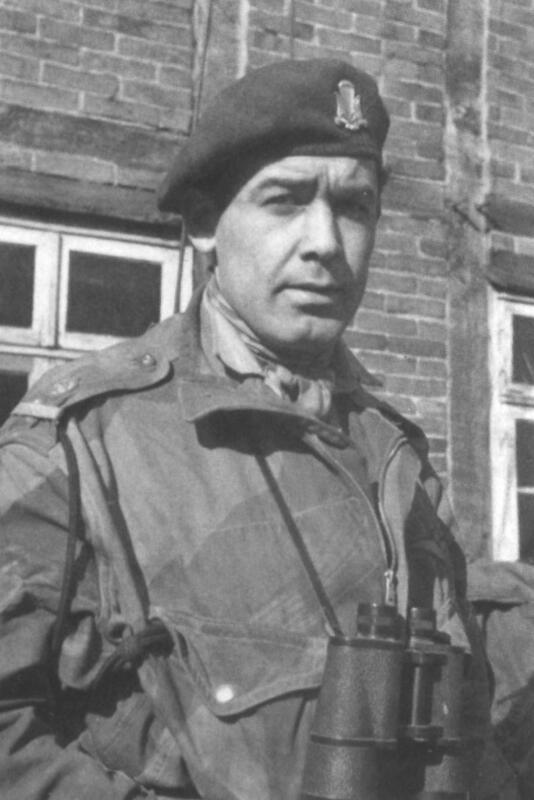 Little did I know that Lieutenant-Colonel Fraser Eadie was a decorated paratrooper from the 1st Canadian Parachute Battalion in the Second World War. I picked up the Colonel at Pembroke Airport and began heading toward CFB Petawawa. In his seventies or so, my passenger appeared fit and distinguished, sporting grey hair and he was well spoken. As we were driving along he asked me to make a stop at the Canadian Airborne Forces Museum. He said he had not been there in a long time and that it used to be one of his favourite spots to visit, where he could become absorbed in our history. We arrived at the museum about fifteen minutes later and headed inside. He was dressed in casual civilian clothing and I was in uniform as we walked together down one of the museum’s halls. There were not many others around, so our footsteps and voices echoed as we strolled along viewing various exhibitions dating back to the Second World War. We stopped in front of a framed photograph of a confident-looking younger man wearing his maroon beret and with a pair of binoculars lying against his chest. The Colonel studied the picture for a long time and squinted at the text beside it engraved on a small bronze plaque. Standing next to him, I could just make out some of the text over his left shoulder. It said something about the soldier being a Second World War veteran with all kinds of recognition for bravery. “Did you know him, sir?” I asked. That was when I realized that I had been assigned to chauffeur a genuine war hero. We stood there for a long time as I asked Colonel Eadie about his experiences, and he told me gripping stories about what it was like as a paratrooper during the war. He was part of Canada’s very first elite airborne regiment, the 1st Canadian Parachute Battalion, which landed in Normandy on D-Day, June 6, 1944. He talked about how the Canadians fought there for weeks alongside the British, helping to break the German army in France. He also told me how his commanding officer and friend, Lt.-Col. Jeff Nicklin, had been killed during a landing in Germany in 1945. As second-in-command, Eadie had taken on leading their troops at that point, and he was later promoted to Lt.-Col. and commander of the battalion. He recalled how he and Nicklin had not only been fellow officers, but had also been good friends and athletes in Winnipeg before the war. Nicklin had been a renowned Winnipeg Blue Bomber and two-time Grey Cup winner, while Eadie had been a hockey player with the University of Manitoba and the Chicago Blackhawks. They had both decided to join the airborne regiment after it was created in 1942. As the war was coming to an end, Eadie said that he and his troops marched eastward and captured Wismar, Germany, which was the furthest point east reached by any Commonwealth troop. Eadie also talked about how different the military was back then and how it had changed over time. He mostly referred to how little support our forces were receiving from the government and, even the Canadian people, as the defence of our country and its values did not seem as urgent in 1989. I told him I didn’t understand. I was supposed to accompany him every day. I thanked him for the amazing and unexpected gift and marveled at the fact that I had just spent the afternoon with a true hero and leader. Col. Eadie had shown me how important it is to balance duty with family and this was a lesson I often remembered during my times overseas in Bosnia and Afghanistan. Editor’s note: Lieutenant-Colonel Fraser Eadie (1917-2003) served as Honorary Colonel of the Canadian Airborne Regiment from 1989 to 1994. His service during the Second World War in the 1st Canadian Parachute Battalion was recognized with the Distinguished Service Order, 39-45 Star, France and Germany Star, Defence Medal, Canadian Volunteer Service Medal and Class, War Medal 39-45 and the American Silver Star. War Hero is an excerpt from Firefight ©2014 By Rick Kurelo, CD.